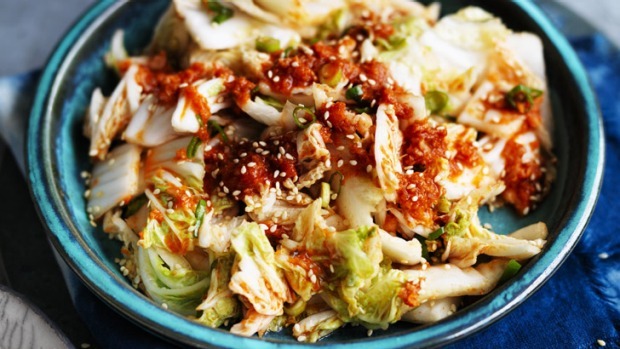 The kimchi is a sure-to-impress addition to the table. It's a great flavour burst - wonderful with any protein and a bowl of rice and steamed greens. Cut off and discard the cabbage root. Cut cabbage lengthways into quarters then cut into 2cm-wide slices. Toss with salt and sugar and leave overnight in the refrigerator. Mix the garlic, ginger, gochujang or chilli sauce, rice vinegar and fish sauce in a bowl. Drain the cabbage. Add the green onion and sesame seeds to the garlic and ginger mix. Combine with the drained cabbage and serve.